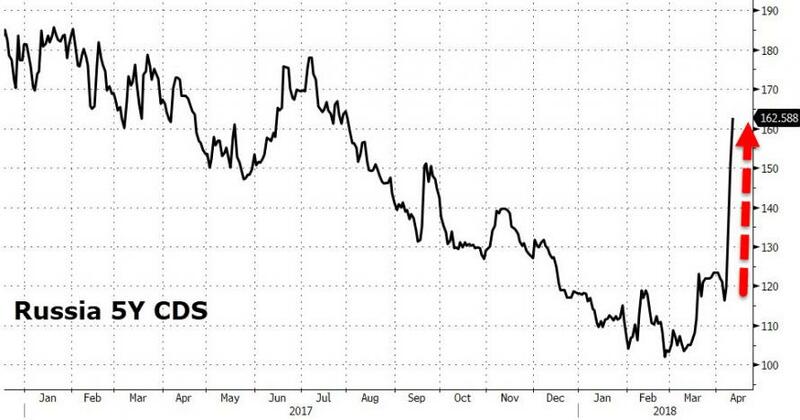 Russia’s 5Y CDS exploded by the most since June 2013 (a 34% spike in default risk in 3 days) this week as US sanctions and now direct threats have escalated geopolitical tensions globally. As Bloomberg notes, President Donald Trump’s warning for Russia to “get ready” for missiles on Syria sent investors rushing for protection. The cost of insuring sovereign debt against default for five years using credit-default swaps jumped to 162 on Wednesday, the highest since Aug. 1. Trump’s tweet added to the pressure that Russian markets have faced since the U.S. imposed its harshest sanctions to date last Friday. Additionally, investors anxiety was further awakened as Turkish Defense Minister Nurettin Canikli said in interview with TV24 channel on Wednesday. “If there’s an attack by U.S.-supported forces to the forces that Russia supports” in Syria, the latter wouldn’t leave that unanswered. All of which means Russia is now ‘riskier’ than South Africa, almost as risky as Costa Rica, and twice as risky as India. 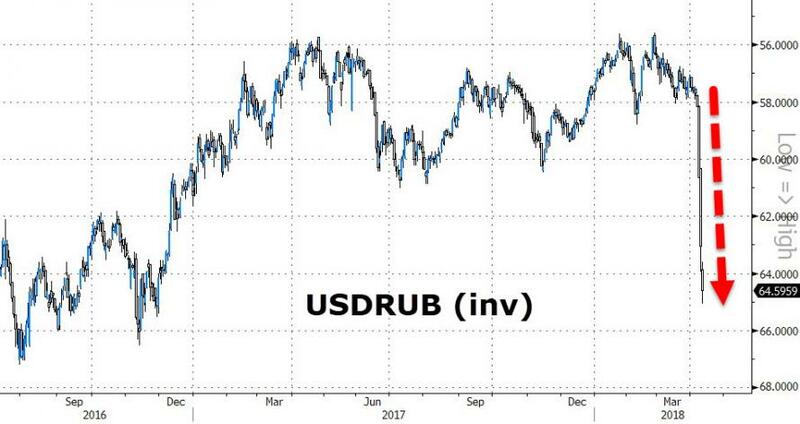 As Bloomberg reports, the volatility prompted the Russian central bank to halt foreign-currency purchases under a budget rule aimed at insulating the economy from swings in oil, Russia’s main export. The Finance Ministry canceled its weekly bond auction for the first time since the 2015 collapse in crude prices. Auctions will resume when the market stabilizes, the ministry said in a statement late Tuesday. Which Has The Bigger Economy: Texas Or Russia?